Other than a rare meal of fish, all of the animal-derived protein that we consume comes from our farm. I have butchered hogs, lambs, rabbits, turkeys, and chickens on my farm. These animals were destined for our consumption and for our friends and families, and on butchering days we usually have a crew who voluntarily help in exchange for some of the meat at the end of the day. 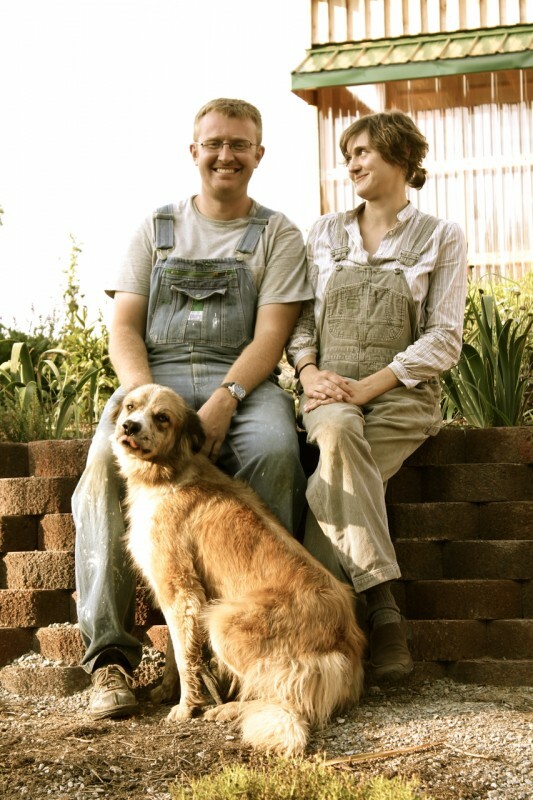 Jonas and Julie Hurley—rebel farmers! We feed the animals who in turn feed the land and us, and the cycle repeats itself through the seasons and years. As one gains proficiency in butchering animals, one starts to take pride in how well one uses every part of the animal, including the off-cuts, sometimes called variety meats, that don’t appear in the meat aisles of the supermarket. I have an idea or two why they don’t appear—seeing a heart, or gizzard, or hog’s head makes one remember that this was a living animal at one point, not a commodity, which one can be lulled into thinking upon seeing rows upon rows of boneless, skinless chicken breasts or pork loins on the supermarket shelves. This little piggy goes to market… but not before being taken from its home, killed by a stranger in a strange environment, and inspected by the USDA. I recently dropped off a batch of hogs to be processed at a USDA-inspected facility so that we can legally sell this meat at our local farmer’s market. Seeing my hogs standing on concrete, huddled, unsure of what exactly to do since this was the first time they had not been on soft ground with the sun overhead, I wondered if whomever was going to slaughter my animal would be as careful, as patient, as I try to be. I have been puzzled and maddened on a number of occasions when abattoirs [ed. note—abattoir is another term for a meat processing facility] have told me that I can’t have (even for an additional charge) a part of the carcass back, because a protocol was not in place to harvest it, or the USDA guidelines specified that the process be done in a particularly time-consuming way, or some other kind of bureaucratic nonsense prevented the edible part from being used. Thus, instead of gizzard sausages (equal parts gizzard, chicken white meat, and pork fat) being made, which has become part of chicken butchering day at my farm and which are remarkably good, these edible parts get dumped in a USDA inspected hole in the ground. Instead of grilled sweetbreads, or terrine of hog’s head (souse meat around here), the abattoirs load these perfectly edible parts onto the gut truck and pay to dispose of them. The last time we butchered a hog on the farm, we had 30 pounds of waste in the gut bucket from a 400 pound animal. In France, artisan butchers claim that with the pig, everything but the oink is used and used well. The fact that many children only see meat via chicken nuggets, hot dogs, and pepperoni saddens me; I hope and believe that a more adult understanding of the ethics and process of eating animals is arising here in America. However, when our local butchers won’t give back the whole carcass or won’t butcher any animals except hogs or cattle, and when Kentucky’s Department of Health guidelines outlaw ANY on-farm processing of animals for sale, a Joel-Salatinesque anger starts boiling up in me. Rabbits are a particularly contentious issue. 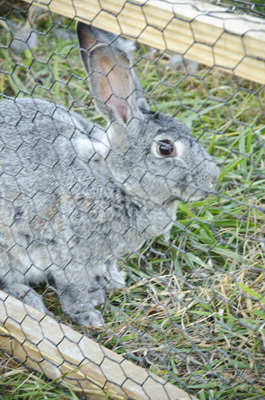 Kentucky demands rabbit meat must be USDA-inspected (even though the USDA allows a certain number to be processed on-farm), but finding a USDA-inspected rabbit processor that will return the meat to the farmer to sell is impossible in Kentucky. 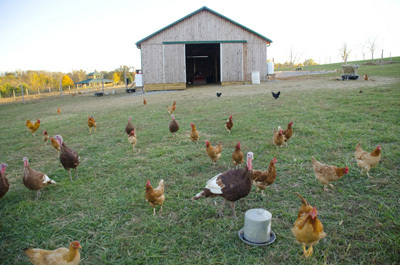 Many states allow a thousand animal exemption for on-farm processing (this applies to poultry but there are exemptions for larger animals as well) for sale at farmer’s markets, but Kentucky does not. Not one drumstick, lamb chop, or sausage link can be sold without it being processed at a USDA inspected facility. These guidelines are certainly well-intentioned and have certainly saved people from contracting food-borne illnesses in our centralized system of meat production. But, Salatin has had an outside lab compare salmonella counts on his on-farm prepared chicken to chlorinated factory chickens, and Salatin’s salmonella counts were markedly lower, and I bet most would say his birds are tastier. The proof really is in the pudding. Slaughter houses, even the good ones, are miserable places to work and more often than not pay poorly. When we butcher a few times a year to feed us for the year, it becomes one of the cycles of the farm, like spring lambing or fall wood-chopping, and reminds us that something, either plant or animal, is giving up its life for us to have ours. However, when our culture demands that a few unfortunate workers in huge slaughterhouses hidden in rural America have to slaughter animals every day, all day, all year, I am ashamed. Here and there one sees glimmers of hope. In Portland, Oregon, a young woman, who had long been a vegetarian, opened the Portland Meat Collective where people, even kids in high school, can take an animal from the barnyard to the dining room table. Her name is Camas Davis, and amusingly in the recent New York Times article about her venture, when asked why she started eating meat again after years of vegetarianism, she replied “I was hungry.” I have called my state senator regarding Kentucky’s lack of an on-farm processing exemption and was politely told that this issue was probably not on the minds of many constituents and would likely not make the congressional agenda any time soon. It is not likely that Kentucky will see a Meat Collective any time soon either, but consumers can buy straight from farmers at farmer’s markets, or better yet, contact your farmer to find out the next time they are butchering on farm. Ask if you can help in exchange for meat. You can legally buy an animal on the farm and the farmer can provide the service of butchering the animal for you on premises. You can learn the craft of curing, salting, sausage making—putting up as my grandparents would say. We’ll be butchering hogs again late this fall. It’s a grand time, the smoke of the fires (3 of them in fact—one for the scalding vat, one to render lard, and one to make headcheese), the smell of the bacon, ham, and sausage spices (that’s another thing the abattoirs can’t provide to farmers—air-cured ham—it’s called prosciutto in Italy and country ham in Kentucky but it’s the same thing and I have 80 pounds of it hanging in my smokehouse right now), seeing the abundance pile up in the coolers and freezers and smokehouse. Drop me a line sometime this summer and I’ll give you the date. Great article! I believe that the state legislature or KDA would be the ones to allow the on-farm processing, at least for poultry and rabbits. The USDA allows states to set maximums, but Kentucky just hasn’t done that. West Virginia just upped their max so I don’t know why KY couldn’t do the same. With all the talk Jamie Comer is giving about local foods, one would hope he’d be behind this if some farmers brought it to his attention. Check in with Community Farm Alliance (www.communityfarmalliance.org), they might be able to help! This is a great subject. I recently butchered some goats on my parents’ farm. It was done as humanely as it gets. My mom has started calling me the Goat Whisperer and we’re talking about potentially putting on a workshop in the fall on humane goat slaughtering for the homesteader. I basically set the goat on my lap, talk to it and rub it gently and then quickly slice it’s neck with a very sharp knife. I let it bleed out into a bucket and then proceed with hanging it and butchering it. It’s very quick, the goat doesn’t even know what happens, and you don’t have to worry about rigor mortis setting in. We let kids of all ages watch and they were all very curious, but weren’t upset in the least. They understand that it’s just part of the farm life and are very excited when it comes time to eating. This article just brought tears to my eyes. It is so sad how far away from our food we have come. I want my daughter to know what she is eating. From a young age I have made sure she understands the animal and the life cycle. I would love to bring her to your farm so she can see the love, the respect the animals that feed us deserve. We are in the city but still manage a good size garden. I take time everyday to teach her the lost arts of homemaking. I was never taught anything but to work a can opener. I have sought out every avenue to learn and recently processes my first deer. It was a beautiful, humbling experience that I am better for. Thank you for sharing your thoughts. There’s another option – people can buy the pig from you and then pay you to teach them how to butcher it on the farm. Even if you do a lot of the work, as long as you’re teaching them, it appears to be legal. If you want to, look up Wind Ridge Farm, it’s in central KY, and they do that. Of course, it’s a lot more time, but from the one time I led a butchering class I can say it’s pleasurable work, connecting people to their food in such an intimate way. 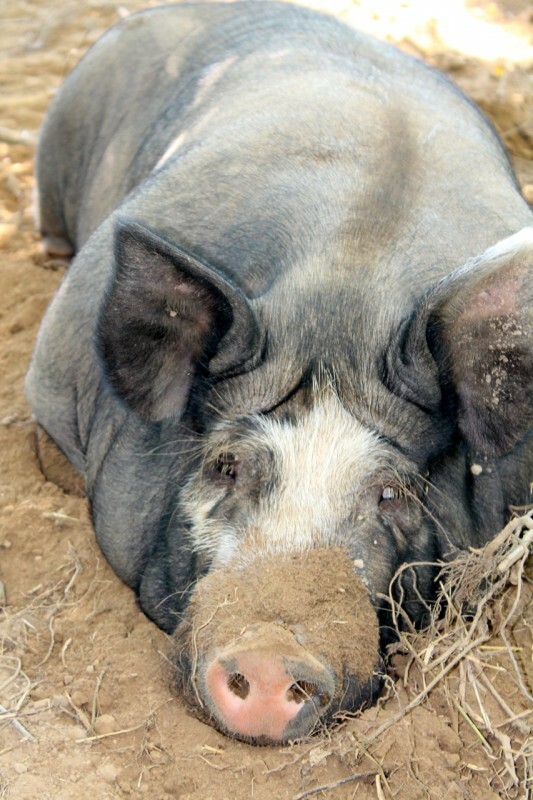 It works better with smaller pigs like Kune Kune, Guinea Hogs, or Asian Heritage Hogs, since they’re far easier for people to handle, weight-wise, and can be chilled in a cooler (or two).